The LTV A-7 Corsair II is an American carrier-capable subsonic light attack aircraft manufactured by Ling-Temco-Vought (LTV) to replace the Douglas A-4 Skyhawk. Its airframe design is a somewhat smaller version of the supersonic Vought F-8 Crusader. The Corsair II initially entered service with the United States Navy (USN) during the Vietnam War. It was later adopted by the United States Air Force (USAF), including the Air National Guard (ANG), to replace the Douglas A-1 Skyraider and North American F-100 Super Sabre. The aircraft was also exported to Greece in the 1970s, and to Portugal in the late 1980s. The USAF and USN retired the type in 1991, the ANG in 1993, the Portuguese Air Force in 1999, and the Hellenic Air Force in 2014. In 1962, the United States Navy (USN) began preliminary work on the VAX (Heavier-than-air, Attack, Experimental), a replacement for the A-4 Skyhawk with greater range and payload. Particular emphasis was placed on accurate delivery of weapons to reduce the cost per target. The requirements were finalized in 1963, announcing the VAL (Heavier-than-air, Attack, Light) competition. To minimize costs, all proposals had to be based on existing designs. Vought, Douglas Aircraft, Grumman and North American Aviation responded. The Vought proposal was based on their successful F-8 Crusader fighter with a similar configuration, but shorter with a rounded nose, giving it a stubbier appearance. It was selected as the winner on 11 February 1964, and on 19 March the company received a contract for the initial batch of aircraft, designated A-7. In 1965, the aircraft received the popular name Corsair II. Vought previously produced two aircraft known as "Corsair". During the 1920s they produced the O2U Corsair biplane scout and observation aircraft, and during World War II they made the highly successful F4U Corsair. Compared to the F-8 fighter, the A-7 had a shorter, broader fuselage. The wing had a longer span, and the unique, variable incidence feature of the F-8 wing was omitted. To achieve the required range, the A-7 was powered by a Pratt & Whitney TF30-P-6 turbofan producing 11,345 lbf (50.5 kN) of thrust, the same innovative combat turbofan produced for the General Dynamics F-111 Aardvark and early Grumman F-14 Tomcats, but without the afterburner needed for supersonic speeds. VA-147 was the first operational USN A-7 squadron, in 1967. Initial operational basing/homeporting for USN A-7 squadrons was at NAS Cecil Field, Florida for Atlantic Fleet units and NAS Lemoore, California for Pacific Fleet units. This was in keeping with the role of these bases in already hosting the A-4 Skyhawk attack squadrons that would eventually transition to the A-7. Lynn Garrison in a Chance Vought F4U-7 Corsair leads A-7 Corsair IIs of VA-147, over NAS Lemoore, California on 7 July 1967 prior to the A-7's first deployment to Vietnam on USS Ranger. The A-7A "NE-300" is the aircraft of the Air Group Commander (CAG) of Attack Carrier Air Wing 2 (CVW-2). From 1967 to 1971, a total of 27 US Navy squadrons took delivery of four different A-7A/B/C/E models. The Vought plant in Dallas, Texas, employed up to 35,000 workers who turned out one aircraft a day for several years to support the navy's carrier-based needs for Vietnam and SE Asia and commitments to NATO in Europe. In 1974, when USS Midway became the first Forward Deployed Naval Force (FDNF) aircraft carrier to be homeported in Yokosuka, Japan, two A-7A squadrons assigned to Carrier Air Wing Five (CVW-5) were concurrently homeported at NAF Atsugi, Japan. In 1976, these squadrons (VA-93 and VA-56) finally transitioned to the much more advanced A-7E model. Six Naval Reserve attack squadrons would also eventually transition to the A-7, operating from NAS Cecil Field, Florida; NAS Atlanta/Dobbins ARB, Georgia; NAS New Orleans, Louisiana; NAS Alameda, California and NAS Point Mugu, California. An additional active duty squadron stood up in the 1980s, Tactical Electronic Warfare Squadron 34 (VAQ-34) at NAS Point Mugu, operating twin-seat TA-7C and EA-7L aircraft with both a pilot and a naval flight officer in an adversary electronic warfare role. Pilots of the early A-7s lauded the aircraft for general ease of flying (with the exceptions of poor stability on crosswind landings and miserable stopping performance on wet runways with an inoperative anti-skid braking system) and excellent forward visibility but noted a lack of engine thrust. This was addressed with A-7B and more thoroughly with A-7D/E. The turbofan engine provided a dramatic increase in fuel efficiency compared with earlier turbojets – the A-7D was said to have specific fuel consumption one sixth that of an F-100 Super Sabre at equivalent thrust. An A-7D carrying 12 x 500 lb (230 kg) bombs at 480 mph (770 km/h) at 33,000 ft (10,000 m) used only 3,350 lb (1,520 kg) of fuel per hour. Typical fuel consumption at mission retrograde during aircraft carrier recovery was approximately 30 pounds per minute (14 kg/min) compared to over 100 pounds per minute (45 kg/min) for the Phantom F-4J/N series. The A-7 Corsair II was tagged with the nickname "SLUF" ("Short Little Ugly Fucker") by pilots. Carrier catapult launches at maximum weight under these performance-robbing conditions were not significantly better and were characterized by the aircraft decelerating by as much as 20 knots (37 km/h) immediately after launch. As a result, A-7A units operated their aircraft 4,000 pounds (1,800 kg) below the rated maximum takeoff weight for the A-7E. In a sortie against the Thanh Hóa Bridge on 6 October 1972, four A-7Cs from VA-82 successfully delivered 8,000 lb of high explosives with two aircraft carrying two 2,000 lb (910 kg) Walleyes, while two others also carried 2,000 lbs in Mk 84 GP bombs. In a simultaneous attack, the center piling on the bridge's west side was hit and broke the span in half. After this, the Thanh Hoa bridge was considered permanently destroyed and removed from the target list. YA-7D-1-CV AF Serial No. 67-14582, the first USAF YA-7D, 2 May 1968. Note the Navy-style refueling probe and the modified Navy Bureau Number used as its USAF tail number. The United States Army has not been permitted to operate fixed-wing combat aircraft since the establishment of an independent United States Air Force (USAF) in 1947. 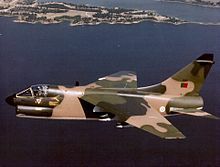 To meet its need for close air support of its troops in South Vietnam, the Army pressured the Air Force to procure a specialized subsonic close air support fixed-wing aircraft that would suit its needs better than the general-purpose supersonic aircraft that the USAF preferred. The A-7D differed from the Navy's Corsair II in several ways. For one, the Air Force insisted on significantly more power for its Corsair II version, and it selected the Allison TF41-A-1 turbofan engine, which was a license-built version of the Rolls-Royce Spey. It offered a thrust of 14,500 lbf (64,000 N), over 2,000 lbf (8,900 N) greater than that of the TF30 that powered the Navy's Corsair IIs. Other changes included a head up display, a new avionics package, and an M61A1 rotary cannon in place of the two single-barreled 20-mm cannon. Also included was a computerized navigation/weapons delivery system with AN/APQ-126 radar and a head-up display. A-7D-7-CV Corsair IIs 70-0976, 70-0989 and 70-0970 of the 354th Tactical Fighter Wing over the skies of Southeast Asia. '976 and '989 were retired to AMARC in 1992, ' 970 is on permanent display at the National Museum of the United States Air Force, Wright-Patterson AFB, Ohio. 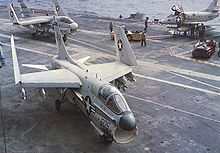 Taking over from Douglas A-1 Skyraiders (and adopting their call sign of "Sandy"), the A-7's higher speed was somewhat detrimental for escorting the helicopters but the aircraft's high endurance and durability were an asset and it performed admirably. On 18 November 1972, Major Colin A. Clarke led a successful CSAR mission near Thanh Hoa to rescue a downed Republic F-105 Thunderchief crew. The mission lasted a total of 8.8 hours during which Clarke and his wingman took a number of hits from 0.51 cal (12.7 mm) anti-aircraft fire. For his actions in coordinating the rescue, Clarke was awarded the Air Force Cross, the USAF's second-highest decoration for valor, and his A-7D (AF Serial No. 70-0970) was eventually placed on display on 31 January 1992 at the National Museum of the United States Air Force at Wright-Patterson AFB, Ohio. 3d TFS A-7D-10-CV Corsair II 71-0309 at Korat Royal Thai Air Force Base, 1973. With the end of US involvement in South Vietnam, the 354th TFW, deployed at Korat, began flying combat sorties in Cambodia to support the Lon Nol government in support of Khmer National Armed Forces against the Khmer Rouge. Rotational deployments began to Korat from the 355th TFW and 23d TFW, with pilots and support personnel beginning six-months deployment cycles. In March 1973, the 354th transferred a squadron of A-7Ds to the 388th TFW, the host wing at Korat RTAFB at the time, which re-established the 3d Tactical Fighter Squadron and created a permanent USAF A-7D presence in Southeast Asia. A-7Ds from both wings stationed at Korat engaged in combat operations in Cambodia until 15 August 1973 when an A-7D of the deployed 353d TFS/354th TFW carried out the last air support mission. In March 1974, the 354th TFW transferred several more aircraft to the 3d TFS prior to its return to Myrtle Beach AFB. A VA-192 A-7E over Vietnam. This aircraft was lost on 2 November 1972. The Navy was sufficiently impressed with the increased power offered by the A-7D Spey engine used by the Air Force, and decided to use this engine for its own version of the Corsair II. The designation A-7E was assigned, and this version was to succeed the A-7B in production. However, there were delays in the deliveries of the TF41-A-2 engine specified for the A-7E, so the first 67 aircraft of the order were delivered with the TF30-P-5 engine. These aircraft had all of the other improvements planned for the A-7E, including the improved avionics and the M61 rotary cannon, and were re-designated A-7C after delivery. The first Spey-powered A-7E flew for the first time on 9 March 1969. The A-7E differed from the USAF A-7D in retaining the probe-and-drogue midair refueling system of the earlier A-7A/B. It entered service in Southeast Asia in May 1970 with VA-146 and VA-147 deployed aboard USS America. The A-7E participated in numerous close-air support missions over both North and South Vietnam, the A-7E's state-of-the-art bombing and navigation system being particularly reliable and accurate. Most air wings operating Douglas A-4 Skyhawks and early A-7s were re-equipped with A-7Es. 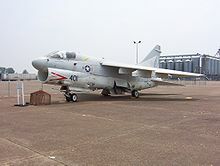 The A-7E participated in the mining of Haiphong harbor in 1972, and played a vital role in Operations Linebacker I and Linebacker II that led up to the formal end of US involvement in the Vietnam War on 24 January 1973. On 15 May 1975, A-7E aircraft operating from USS Coral Sea, in conjunction with A-7D aircraft assigned to the 3d TFS at Korat RTAFB, provided air cover in what is considered the last battle of the Vietnam War, the recovery of SS Mayagüez after it was hijacked by Khmer Rouge gunboats. By the time the Mayaguez incident was over, three USAF Sikorsky CH-53 Sea Stallion helicopters had been shot down, two airmen, 11 Marines and two Navy Corpsmen had been killed in action and a further three Marines were missing in action. With the pullout of the USAF from its Thailand bases in late 1975, the A-7Ds stationed at Korat initially went to Clark AB, Philippines. The 3d TFS transitioned from its Corsairs to the McDonnell Douglas F-4E Phantom II and remained at Clark. The A-7Ds were returned to the United States where they were reassigned to several Air National Guard squadrons. With the end of the Vietnam War, the Air Force began to transfer its active duty A-7D aircraft to Air National Guard units beginning in 1974. The Corsairs had been, in a sense, a forced acquisition by the Air Force in the late 1960s, and the inter-service rivalry of flying a Navy aircraft had led, beginning about 1970, to the development of its own Close Air Support aircraft. In 1974, selection of the Fairchild Republic A-10 Thunderbolt II was made as the replacement for the A-7D. The first A-10As were received by the 354th TFW in 1977 at Myrtle Beach AFB; the 355th TFW at Davis-Monthan AFB began replacing its A-7Ds in 1978, and the 23d TFW at England AFB in 1979. As the A-10s were received, the A-7Ds were transferred from the USAF to the National Guard Bureau for subsequent re-allocation. By 1981, when the 23d TFW sent its last A-7Ds to Tonopah Test Range Airport, Nevada for clandestine use in the Lockheed F-117 Nighthawk development program, fifteen ANG squadrons were equipped with the A-7D Corsair II. However, Congressional decisions added additional funding to the DOD FY 1975 and FY 1976 budgets for the procurement of additional A-7Ds, primarily to keep the LTV production line in Dallas open and the workers employed in the wake of post-Vietnam DOD procurement reductions. As a result of these unplanned acquisitions, the Air Force assigned these new aircraft (all with 1975 tail numbers) to the Arizona Air National Guard 152nd Tactical Fighter Squadron at Tucson, which operated the Air National Guard transition training school for Corsair II pilots. In 1978, a two-seat A-7 trainer was developed by LTV for the Air Force, designated the A-7K. One prototype aircraft was built by modifying an existing A-7D airframe, however production A-7Ks were new builds with 1979 and 1980 tail numbers. The A-7K was a fully combat capable aircraft as well as a dual-control training aircraft. Most of the A-7K trainers went to the transition school at Tucson, with the squadrons' A-7Ds being re-distributed to other ANG squadrons. However all ANG squadrons were assigned an A-7K trainer as well as their complement of A-7Ds. During the post-Vietnam era, the Air National Guard frequently deployed its Corsairs on annual operational exercises. Deployments were made to NATO and USAFE bases in West Germany and Denmark as part of training exercises along with the USAREUR Reforger training exercises. Beginning in 1974, active-duty squadrons from Myrtle Beach, England and Davis-Monthan Air Force Bases began deployments of A-7Ds to Howard AFB, Panama to train with Army and Naval forces defending the Panama Canal. These deployments, named "Cornet Cove" generally were of ninety (90) days, and were rotated among squadrons of the three wings in the United States. Beginning in 1977, with the phaseout of the A-7D with active-duty units, the Air National Guard began taking over this mission. In December 1989, the South Dakota 175th Tactical Fighter Squadron and Ohio 112th Tactical Fighter Squadron were at Howard AFB on a Coronet Cove deployment when President George H.W. Bush announced Operation Just Cause, the United States Invasion of Panama. The ANG squadrons participated in the invasion, flying 34 combat missions, completing 34 sorties, expended 71.7 flying hours and expended 2,715 rounds of ordnance. On 12 January 1981, in the 1981 Luis Muñoz Marín International Airport attack, 10 A-7Ds of the 198th Tactical Fighter Squadron, Puerto Rico Air National Guard were destroyed or damaged in a terrorist attack by the Boricua Popular Army at Muniz Air National Guard Base in the largest attack ever on an American military station since the Vietnam War. This terrorist attack was largely unreported due to the Iran hostage crisis at the time. A-7E of VA-72 on USS America off Libya in April 1986. 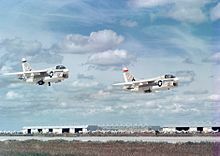 Navy A-7E squadrons VA-15 and VA-87, from USS Independence, provided close air support during the Invasion of Grenada, codenamed Operation Urgent Fury, in October 1983. Navy A-7s also provided air support during the U.S. mission in Lebanon in 1983. An A-7 and an A-6 Intruder were shot down by Syrian surface-to-air missiles (SAM) on 4 December 1983. The A-7 pilot, Commander Edward Andrews, managed to guide his failing Corsair over coastal waters before ejecting; he was rescued by a Lebanese fishing boat and safely returned to the U.S. Marines. On 24 March 1986, during the Gulf of Sidra dispute with Libya, Libyan air defense operators launched SA-5 missiles at two Fighter Squadron 102 (VF-102) Grumman F-14 Tomcats from USS America that were orbiting in international air space on a Combat Air Patrol (CAP) station. A-7s operating from USS Saratoga responded by launching the first AGM-88 HARM missiles ever used in combat. On the next day, A-6s attacked Libyan warships approaching the US fleet, while A-7s again launched HARM missiles against Libyan SAM sites. In April 1986, navy Sixth Fleet A-7Es from VA-72 and VA-46 embarked on board USS America also participated in Operation El Dorado Canyon, the retaliatory attack on Libya, using HARM and Shrike anti-radar missiles to protect the naval strike force from SAMs. While USAF A-7s stayed home in favor of A-10s, the USN deployed two of its last A-7E squadrons to Operation Desert Shield in August 1990 aboard USS John F. Kennedy, the only carrier of six deployed to Desert Storm to operate the A-7. The navy squadrons VA-46 and VA-72 made the last combat sorties of the A-7 in Operation Desert Storm flying from the Red Sea to targets throughout Iraq. The A-7 was used both day and night to attack a wide range of heavily defended deep interdiction targets in Iraq as well as "kill boxes" (geographically defined kill zones) in Kuwait, employing a variety of weapons including precision-guided munitions (PGMs), such as the TV-guided Walleye glide bomb, unguided general purpose bombs, and High Speed Anti-Radiation missiles (HARM). The A-7 was also used as a tanker in numerous in-flight refueling missions. The 4450th Tactical Group stationed at Nellis AFB, Nevada had the distinction of being the last active USAF unit to operate the A-7 Corsair II. The mission of the 4450th TG was the operational development of the Lockheed F-117 Nighthawk, and the unit needed a surrogate aircraft for pilot training and practice. A-7Ds and A-7Ks were obtained from various active duty and air national guard squadrons and were assigned initially to the "(P)" or "Provisional" unit of the 4450th Tactical Group, redesignated the 4451st Tactical Squadron in January 1983. The A-7s were used as a deception and training aircraft by the group between 1981 and 1989. It was selected because it demanded a similar pilot workload expected in the F-117A, was single seat, and many of the F-117A pilots had F-4 or F-111 backgrounds. A-7s were used for pilot training before any F-117As had been delivered, to bring all pilots to a common flight training base line. 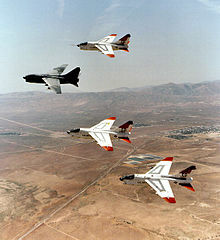 Later, the A-7s were used as chase planes on F-117A tests and other weapon tests at the Nellis Range. A-7 flight operations began in June 1981 concurrent with the very first YF-117A flights. The A-7s wore a unique "LV" tailcode (for Las Vegas) and had a dark purple/black paint motif. The A-7s were based officially at Nellis Air Force Base and were maintained by the 4450th Maintenance Squadron. In addition to providing an excuse for the 4450th's existence and activities, the A-7s were also used to maintain pilot currency, particularly in the early stages when very few production F-117As were available. The pilots learned to fly chase on F-117A test and training flights, perform practice covert deployments, and practice any other purpose that could not be accomplished using F-117As, given the tight restrictions imposed on all F-117A operations. Some A-7s operated from the Tonopah Test Range Airport, about 30 miles (48 km) southeast of Tonopah, Nevada where the F-117s were being operationally tested. As a deception operation, care was taken to ensure that F-117As were never left parked outside aircraft hangars during daylight hours. However, A-7s were deliberately and routinely left outside hangars for the benefit of any orbiting Soviet spy satellites. Soviet intelligence agencies examining spy satellite imagery of the base would undoubtedly notice the A-7s parked on the Tonopah flight line, and would not be particularly interested. The intention of this deception was to convince the Soviets that Tonopah operated nothing more exciting than some obsolete A-7 Corsairs. The cover story to the public was that the A-7s were flying "radar calibration missions" out of Tonopah. Also, in order to help maintain the deception, about five or six A-7Ds were deployed to South Korea in 1984 and 1988. In South Korea they trained with the Army for about a month in Close Air Support operations. It appeared to the Russians that it was a real squadron with a combat mission because the aircraft could be seen having munitions loaded and performing training missions. There were approximately 20 A-7D aircraft used in developing the F-117, including several two-seat A-7K trainers. In January 1989, three months after the USAF admitted the F-117A existed, the A-7s were retired to AMARC and were replaced by AT-38B Talons as training aircraft and the 4451st TS was deactivated. Pilots quipped that the Corsair "is not very fast, but it sure is slow." For dissimilar air combat training (DACT), and aerial demonstrations by the Blue Angels, the Navy would choose the more nimble Douglas A-4 Skyhawk as a subsonic maneuvering platform, as some considered the A-7 to be inadequate in air combat, even though it was highly maneuverable. While some questioned its air combat capability it was widely regarded as a highly successful attack aircraft, partly by virtue of being a stable bombing platform. Despite this, the Marine Corps also rejected the Corsair, opting instead for the V/STOL (Vertical/Short Take Off or Landing) AV-8 Harrier as its light attack aircraft to replace its A-4F/M Skyhawks. Greece's Hellenic Air Force ordered sixty new A-7H aircraft and five TA-7Hs in 1974. The delivery of the airplanes started in 1975 and equipped the 347, 340, 345 Squadrons. In 1993 Hellenic Air Force received an additional sixty-two A-7Es and nineteen TA-7C surplus USN airplanes who were given to the 335 and 336 Squadrons. The last A-7Es were retired in October 2014 from the 336th Bomber Squadron. The sale of A-7s to Pakistan was not approved due to US opposition to its nuclear program. General Dynamics F-16 Fighting Falcons began replacing the Air National Guard Corsairs beginning in the late 1980s and the last were retired in 1993 by the units at Rickenbacker Air National Guard Base, Ohio; Des Moines Air National Guard Base, Iowa; Tulsa Air National Guard Base, Oklahoma; and Springfield Air National Guard Base, Ohio. USN A-7 Corsairs began being phased out of the fleet during the mid-1980s with the arrival of the McDonnell Douglas F/A-18 Hornet. A-7 squadrons of the United States Navy Reserve transitioned concurrent with (but prior to the completion of) all Regular Navy squadrons. 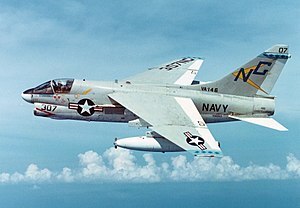 The last Navy A-7s were retired by the last fleet operational squadrons (VA-46 and VA-72) in May 1991 shortly after their return from Operation Desert Storm. By the end of 1998, with the exception of some airframes used as static displays, all US A-7s were disposed of by the Aerospace Maintenance and Regeneration Center (AMARC) at Davis-Monthan AFB, Arizona. Some of these surplus aircraft were passed to Greece, Thailand and Portugal. The last Portuguese Air Force A-7Ps were retired in 2007 after 26 years. The Corsair II served for 49 years. Two-seat trainer version for USN, 24 converted from A-7B, 36 from A-7C. In 1984, 49 airframes, including the 8 EA-7Ls, were re-engined with the TF41-A-402 and upgraded to A-7E standard. Version built for the USAF, with one Allison TF41-A-1 turbofan, and a single M61 Vulcan 20 mm rotary cannon; AN/APN-153 navigational radar in earlier models is replaced by AN/APN-185 navigational radar, AN/APQ-116 terrain following radar in earlier A-7B/C is replaced by AN/APQ-126 terrain following radar; 459 built. Modified A-7E for Greece without air-refueling capability, 60 built. Ex-USN A-7As rebuilt for Portuguese Air Force, 44 refurbished with TF30-P-408 engines and an avionics fit similar to the A-7E. Two-seat trainer version for Portuguese Air Force; six converted from ex-USN A-7As. Greece – Retired in 2014. Portugal – Retired in 1999. Thailand – Non-operational status since 2007. United States – Retired in 1993. ^ on pylon stations 1,3,6 & 8 which are wet plumbed. Used for ferry flight/extended range/increased loitering time. Often carried a hose and drogue type Buddy Store in addition to drop tanks for use as a tanker aircraft. ^ a b c Swanborough and Bowers 1976, p. 292. ^ "Avionics: HUDAVAC." flightglobal.com. Retrieved: 13 October 2010. ^ "procurement executive | avionics industry | avionics survey | 1973 | 2885 | Flight Archive". Flightglobal.com. Retrieved 25 September 2018. ^ Dorr 1987, p. 61. ^ Swanborough and Bowers 1976, p. 293. ^ NAVAIR 01-45AAE-1, pp. 8-48 to 8-148. ^ "Establishment Ceremony: 0900 March 01 1983." VAG 34. Retrieved: 2 October 2012. ^ NAVAIR 01-45AAE-1, pp. 11-1–11-93. ^ NAVAIR 01-45AAA-1, pp. 1–68. ^ NAVAIR 01-45AAE-1, pp. 1–66. ^ NAVAIR 01-45AAA-1, pp. 1–233. ^ NAVAIR 01-45AAE-1, pp. 1–177. ^ Hobson 2001, pp. 268–69. ^ a b c d e f g h i Munzenmaier 2009. ^ a b Wagner 1982. ^ a b c LTV A-7D Corsair II. National Museum of the United States Air Force. ^ "A-7D 70-970 Factsheet." Archived 3 February 2012 at the Wayback Machine National Museum of the United States Air Force. ^ Hobson 2001, pp. 268, 269. ^ a b Swanborough and Bowers 1990. ^ Wetterhahn, Ralph. The Last Battle: The Mayaguez Incident and the End of the Vietnam War. New York: Plume, 2002. ISBN 0-452-28333-7. ^ "The A-10 Warthog, The Best Deal the Air Force Never Wanted". ^ "AFHRA Wings and Groups 354th TFW, 355th TFW and 23d TFW organizational records". Archived from the original on 11 February 2013. ^ "Around the Nation: 8 Military Jets Destroyed At Air Base in Puerto Rico." The New York Times, 12 January 1981. Retrieved: 13 October 2010. ^ a b Dorr 1987, p. 63. ^ Rausa 1987, p. 34. ^ a b Mersky 2003, p. 150. ^ Airforce.gr. "A-7 Retirement: Araxos AB, 17th October 2014". www.airforce.gr. ^ Taylor, John W. R.. (1983). Jane's All the World's Aircraft 1982-83. London: Jane's Publishing Company. ISBN 0-7106-0748-2. ^ Donald 1997, p. 899. ^ Wilson 2000, p. 141. ^ "Aerospaceweb.org - Aircraft Museum - A-7 Corsair II". www.aerospaceweb.org. "A Corsair by any other name: The Story of Sandy, SLUF and the Little Hummers". Air International, Vol. 22, No.3, March 1982, pp. 121–125, 143–146. ISSN 0306-5634. "A Corsair by any other name: Sandy, SLUF and the Little Hummers: Part Two". Air International, Vol. 22, No. 4, April 1982, pp. 169–176, 202–203. Birzer, Norman and Peter Mersky. 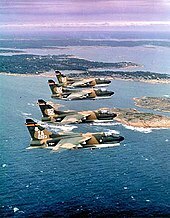 US Navy A-7 Corsair II Units of the Vietnam War (Osprey Combat Aircraft #48). Oxford, UK: Osprey Publishing Limited, 2004. ISBN 978-1-84176-731-4. Brown, David F. SLUF A-7 Corsair II. Hong Kong: Concord Publications Co., 1997. ISBN 978-962-361-723-9. Donald, David, ed. "Vought A-7 Corsair II". The Complete Encyclopedia of World Aircraft. New York: Barnes & Noble Books, 1997. ISBN 0-7607-0592-5. Dorr, Robert F. "A Plus for the Corsair". Air International, Vol. 33, No. 2, August 1987, pp. 61–65, 84—87, 93. Bromley, UK: Fine Scroll. ISSN 0306-5634. Eden, Paul (editor). The Encyclopedia of Modern Military Aircraft. London: Amber Books, 2004. ISBN 1-904687-84-9. Frawley, Gerald. "Vought A-7 Corsair II". The International Directory of Military Aircraft, 2002/2003. Fishwick, Act: Aerospace Publications, 2002. ISBN 1-875671-55-2. Gunston, Bill. Modern Fighting Aircraft. New York: Random House, 1984.ISBN 0-517-44115-2. Higham, Robin and Carol Williams. Flying Combat Aircraft of USAAF-USAF (Volume 2). Andrews AFB, Maryland, USA: Air Force Historical Foundation, 1978. ISBN 0-8138-0375-6. Hobson, Chris. Vietnam Air Losses, USAF/USN/USMC, Fixed-Wing Aircraft Losses in Southeast Asia, 1961–1973. North Branch, Minnesota, USA: Specialty Press, 2001. ISBN 1-85780-115-6. Holder, Bill and Mike Wallace. Lockheed F-117 Nighthawk: An Illustrated History of the Stealth Fighter. Atglen, Pennsylvania: Schiffer Publishing, Ltd., 2000. ISBN 978-0-76430-067-7. Munzenmaier, Walter. "'LTV A-7D/K Corsair II: The 'SLUF' in USAF and USANG Service 1968–1993", Famous Aircraft of the USAF and USAG, Volume 1. Erlangen, Germany: Double Ugly Books/ / AirDOC, 2009. ISBN 978-3-93568-712-6. NAVAIR 01-45AAA-1, A-7A/B Flight Manual. Washington, D.C., USA: US Navy, 15 August 1973. NAVAIR 01-45AAE-1, A-7C/E Flight Manual. Washington, D.C., USA: US Navy, 1 March 1973. Rausa, Rosario (ed.). "Air Warfare; Chapter III: Power Projection, First Hornet Squadron, Grenada and Lebanon." Pistons to Jets. Washington DC: Department of the Navy – Naval Historical Center, 1987. Schürmann, Roman. Helvetische Jäger: Dramen und Skandale am Militärhimmel (in German). Zürich: Rotpunktverlag, 2009. ISBN 978-3-85869-406-5. Swanborough, Gordon and Peter M. Bowers. United States Military Aircraft Since 1909. Washington, D.C., USA: Smithsonian Books, 1989. ISBN 0-87474-880-1. Swanborough, Gordon and Peter M. Bowers. United States Navy Aircraft Since 1911. Annapolis, Maryland, USA: Naval Institute Press, 1990. ISBN 0-87021-792-5. Wagner, Ray. American Combat Planes . New York: Doubleday, 3rd edition 1982. ISBN 978-0-38513-120-9. Wikimedia Commons has media related to LTV A-7 Corsair II.